Coffee Trail - Counting Stars, Reaching Delphi .✫*ﾟ･ﾟ｡.★.*｡･ﾟ✫*. : She Glitters the flow, She Does. Cauvery! She Glitters the flow, She Does. Cauvery! If you are flying into Tiruchi during the non-dry season, then quick — land yourself in that prize-winning seat next to the window. Just a few minutes before touchdown, look out and prepare yourself for a spectacular view of the river that glides just below. That’s the Grand Cauvery. Tiruchi is the 4th largest municipality in South India and it sits right in the heart of Tamil Nadu state. You’ll find many higher education institutes and large industrial units here. Its recorded history dates all the way back to the 3rd century BC during the rule of the Cholas. It had also been ruled by many other dynasties and superpowers over the years, and each has left a hint of their existence among the culture, people, and architecture. I’d been here several times and even more in recent years thanks to Air Asia and Malindo Air, but each time the visits are usually only for a short stopover. Every time I fly in, I look forward to a glimpse of that glitter slithering below. The sight of Cauvery never ceases to amaze me. And this time, I touched her. 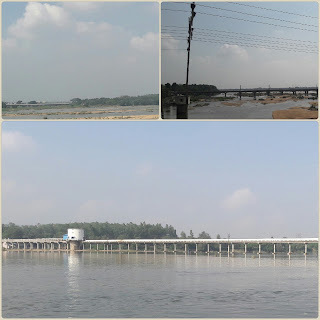 Cauvery, along with her sisters — Mahanadi, Godavari and Krishna — make up what is known as the Peninsular River system in India. Some trivia facts about the 765 km long Cauvery. It is a holy river in South India. On new moon or Amavasya days (which are once a month), many local Hindus come here and offer special prayers for the worship of their forefathers. My task today was to take care of everyone’s belongings (those of my parents and cousins) while they went in to take a dip in the river. Here’s where, later, I touched some of this precious water myself. Warm, complementing the hot weather. The only other two times I remember feeling any river water was when clumsy me accidentally lost my balance and fell in. Not pleasant, but this happened years ago. Just outside are plenty of vendors selling flowers and vegetables. I also noticed they like their coffee as much as I do too. There are plenty of coffee and tea stands to fulfil the demanding caffeine needs, and this sight made me tremendously happy. Since I had two already, I couldn't have any more for the hour. The stall operators didn’t mind and were more than happy to let me watch them prepare the drinks and to pose for a picture or two. 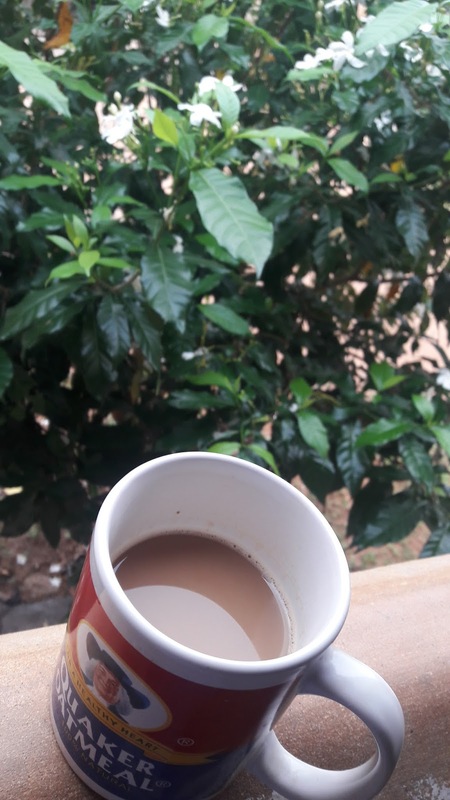 See if you can find the coffee in these shots. In one of these pictures, you can also see an aunt (mami) holding a flask of special home-made Udupi-style filtered coffee. 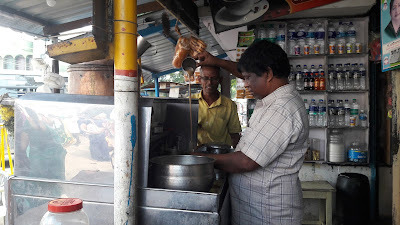 A couple of years ago, her husband took my cousins and me to one of the best Udupi coffee restaurants in Tamil Nadu. She remembered and prepared this one for us 😘. 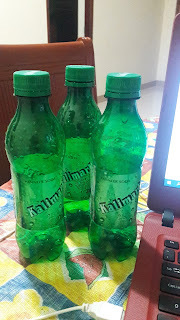 When in Tiruchi or anywhere south of Tamil Nadu, remember to get yourself some Paneer Soda. This is a rose essence carbonated drink. I like Kalimark’s, though I don't fancy the green bottles they are packaged in. This branding reminds me of Sprite, but I feel they can confidently go with a different image because their drink tastes even better. Look, here’s a picture for you. I have already had 3 within the last 8 hours. Well, it's hot, and those empty bottles speak a lot for themselves right now. 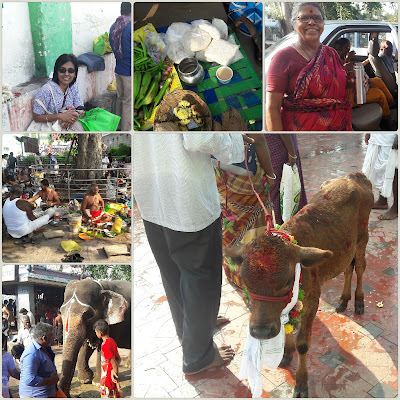 There are plenty of things to do in Tiruchi. A visit to the Rock Fort Temple is one of them. The temple was built in 580 AD on an ancient 83m high rock by the Pallavas. The temple changed hands several times over the years under the different rulers of the period — Pallavas, Pandyas, Cholas and the Nayaks. Plenty of steps to climb here. Be fit, and more importantly choose the right timing because it does get hot in the daytime. 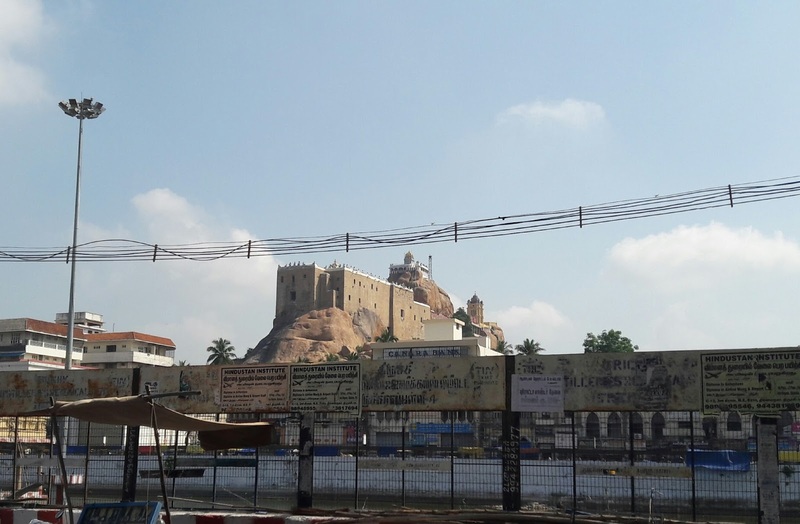 The climb up to the Ganesha temple is a rewarding one — a spectacular view of Tiruchi. The Sri Ranganathaswamy Temple (Sri Rangam) is the largest Hindu temple in India and the biggest functioning temple in the world. 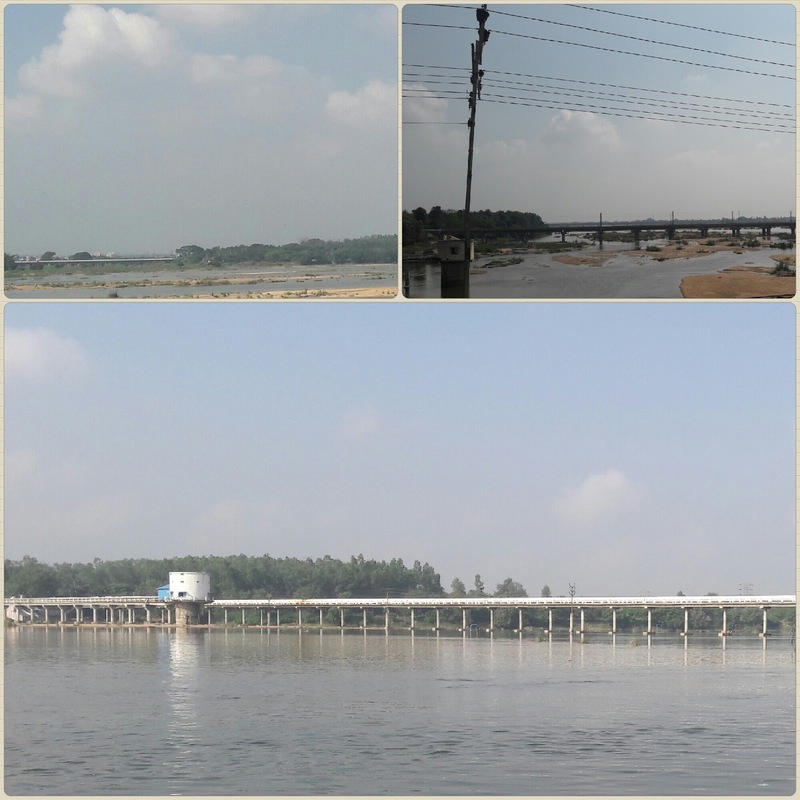 It is surrounded by the Cauvery on one side and the Kollidam on the other. The magnificently structured temple is situated in the little islet formed by these two rivers. The temple's early inscriptions date back to 1 AD. The temple was rebuilt in the 14th century and then fortified and extended in the 15th and 16th centuries. It spans 0.63 km. 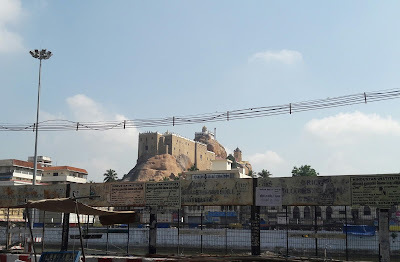 One would have to pass all 7 concentric walled sections to reach the Raja Gopuram, which is 73 metres tall, and this is where the main deity is. There are 21 Gopurams (tower gateways) in total. Between each walled sections are little shops, coffee stalls and restaurants. The temple, first built during the Pallavas reign, is dedicated to Lord Vishnu. 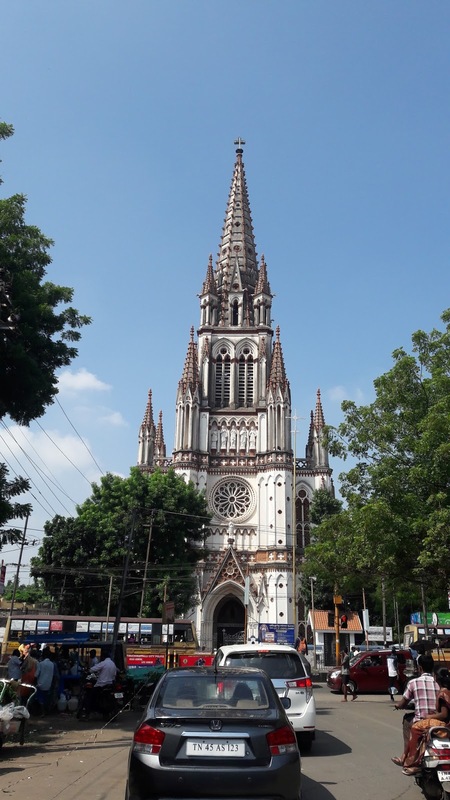 Also, near Rock Fort Temple is an ancient church constructed in 1840, Our Lady of Lourdes Church. This is a Roman Catholic basilica. 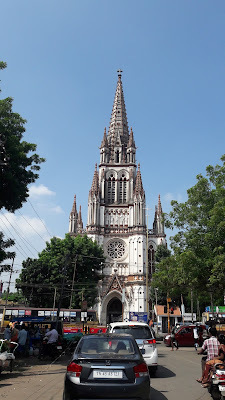 The church stands grandly on a busy street in the centre of the city, she is very pretty, and if you pass by without noticing or looking twice at her, I would be surprised. This is a large Gallo-Catholic designed church. The church conducts holy masses every day, and anyone can join in. Shopping is always one of the welcoming delights for travellers and visitors. Tiruchi offers a good selection of clothes, fabric, saris, sweets & snacks, silverware and other Indian products. The rule is simple, arrive with empty suitcases, and fill them up here. If shopping doesn't get you excited, there is always a coffee and tea shop nearby — grab a glass (or tumbler), sit along the Cauvery’s banks and listen to her poems as she whispers and do enjoy your drink. Traffic Signals, Is It F1 Again?